The Yacht Station at Yarmouth is located just after the second bridge you travel under coming from Breydon Water or just before the same bridge coming from the northern rivers. There is room for many craft and in the peak summer months you might expect to be double moored (side on to another boat) to make more room. The tide can run quite fast here so it is important to approach your mooring against the tide so that the current slows you as you approach the side. The moorings are manned usually from 8am to 8pm by rangers who will help you come alongside and ensure your ropes are tied correctly to take account of the rise and fall, which can be as much as six feet (around 2 metres) here. Water, toilets and showers are available on-shore. 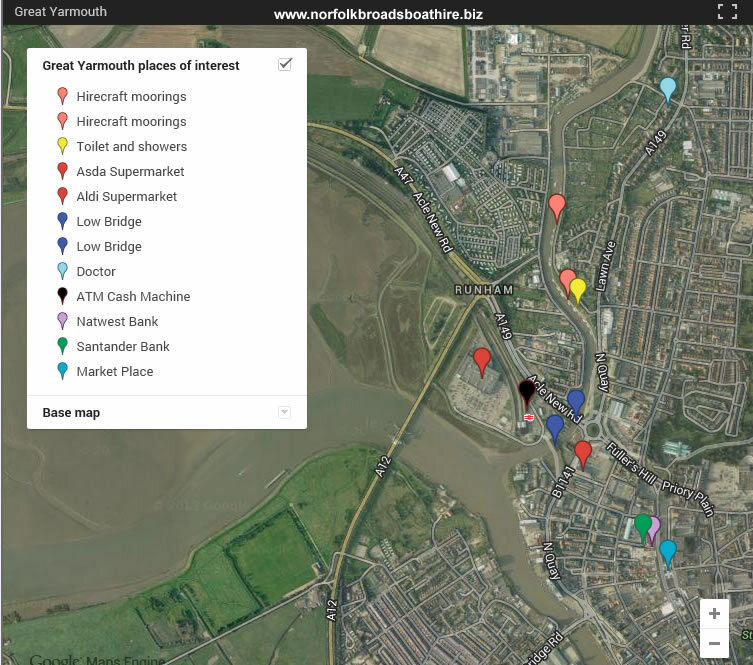 A 10 - 15 minute walk takes you into Great Yarmouth town centre and perhaps a further 15 minutes onwards to the sea. Things to do: Great Yarmouth is a large seaside resort and amongst other attractions you will find a Sealife Centre on the seafront, two piers - Britannia and Wellington, The Marina Seafront Leisure Complex which houses swimming pools with a wave machine and slides, gyms, sports arenas and a children's adventure soft play park. There is also the Pleasure Beach with it's funfair and the Hippodrome Circus. The beach-front stretches for miles and will delight the younger members of the family. Eating and Drinking: There is a huge choice of bars and restaurants in Great Yarmouth catering for all tastes. The nearest to the Yacht Station are the White Swan which is situated close to the road bridge and the Suspension Bridge which occupies the opposite bank. Both offer food and have a varies menu. Other Services: There is an extensive shopping centre within the town centre including a small market and all major banks. Asda supermarket can be found adjacent to the nearby railway station. Aldi is closer near to the road bridge. Numerous takeaways are to be found nearby. The nearest GP surgery is on Lawn Avenue - around 15 minutes walk away. TIP: Asda and Aldi supermarkets are a short walk from the moorings making it a good place to stock up with supplies for the rest of the holiday.